Everyone loves pi - and we enjoy celebrating the most delicious number of all every year on March 14 (3.14). 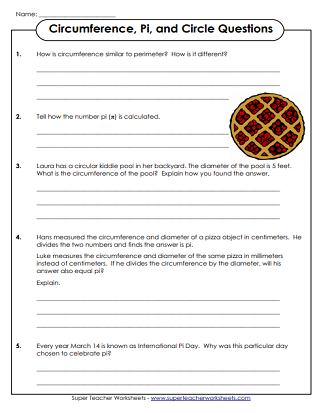 The worksheets on this page can be used to teach students about the number pi. Sing the "Pi Song" with your class. 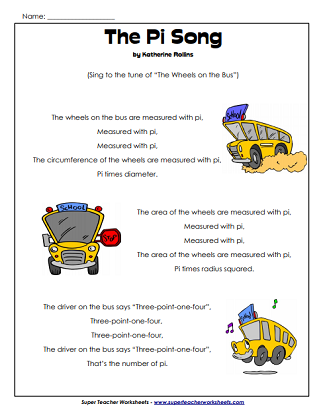 It's an adorable song to the tune of "The Wheels on the Bus." 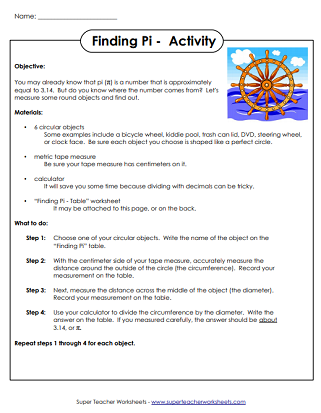 In this activity, students use a tape measure to determine the circumference and diameter of circles. Then they use their data to calculate pi. This is a series of short-answer questions that relate to pi, circles, and circumference. Rearrange the letters in the words "Happy Pi Day" to make as many different words as possible. This version was written specially for students in kindergarten through second grade, and includes primary-ruled paper. Rearrange the letters in the words "Happy Pi Day" to make as many different words as possible. This version has a more complicated scoring guide for students in third through fifth grades. Teach your students to determine the radius, diameter, and circumference of a circle with these worksheets. Would you like to see the complete index of holiday worksheets available on S.T.W.? We have worksheets for Christmas, Valentine's Day, Presidents' Day, and almost every other holiday you can imagine.